a gold coin into a glass maker's crucible. Antonio Neri is best remembered for writing L'Arte Vetraria. It was the first printed book entirely devoted to the formulation of glass, which he published in Florence, Italy, in 1612. If we were to single out just one of his more than a hundred recipes, covering glass, lead crystal, paste gems and enamels, it would have to be his prescription for "Transparent Red" ruby glass made with gold. This recipe still captivates glass artists today, as it has since Neri wrote the book. In fact, gold ruby glass is closely tied to the lore of alchemy and has intrigued experimenters as well as artists and collectors since the Roman Empire, possibly before. Alchemists had long thought gold to be the perfect metal and that all other "lesser" metals (read: lead, tin, copper, iron, mercury and silver) could be coaxed to fully "mature" into gold. Experimenters thought that if they could capture the "essence" of the king of metals, it could be used to "seed" the other metals, and transmute them into pure gold. This is where ruby glass comes into the discussion. In general, glass is colored by the addition of finely powdered metals. Depending on the metal and how it is treated, a whole rainbow of colors can be produced in glass. Alchemists were convinced that the color was an indication that this "essence" of the metal had been released into the glass. treasury chamber of the Wittelsbacher , Munich Residenz. For artists and collectors, gold ruby is simply a very attractive color; the difficulty of producing it and working with it only adds to its cachet. Transparent red in glass can be produced other ways, notably with copper, but copper red has a slightly more orange color. Gold ruby, on the other hand, has a characteristic red color that can have slight hints of purple. It can be made light and ethereal or dark and heavily saturated, but viewed next to its competitors, it has a very distinctive hue that experts pride themselves on recognizing. Neri’s recipe involves moistening gold powder with "aqua regia," which we know as a mixture of nitric and hydrochloric acids. He then spreads this wet mixture on an earthenware pan and heats it in the furnace "until it becomes a red powder, which will take place after many days." Here is that color change that alchemists looked for as an indication of transformation; we know today that Neri was producing gold chloride. This is one of the very few chemical compounds that gold forms and in fact, this is one of the main things that makes gold so special: it does not rust, nor corrode or tarnish, which are, in the end, all chemical reactions between the metal and its environment. Neri directs his readers to sprinkle, little by little, the gold chloride into the glass melt. He says to "Use fine cristallo, thrown in water many times." Cristallo is the exceptionally clear glass invented by Venetian craftsmen, and "washing" was a technique to remove excess water soluble flux and other contaminants. He finishes his instructions abruptly by saying this method "will make the transparent ruby red glass; but you must experiment in order to find it." In other recipes, Neri goes to great lengths to explain his methods in detail, here he seems content to barely scratch the surface. Much speculation has taken place over the reason for this surprisingly short recipe. Was he ordered, perhaps by his Medici overlords, to keep details to a minimum? Some have wondered if Neri even knew how to produce gold ruby; the short recipe may have been a cover for his lack of knowledge. 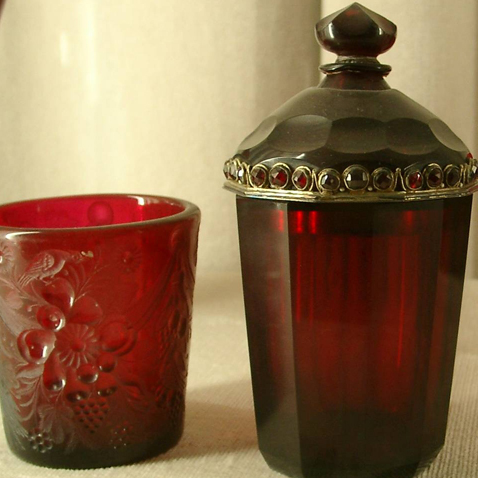 Doubts about Neri's gold ruby glass recipe grew after his death, when it was discovered by other experimenters that the addition of small amounts of tin into the mix produced the ruby color quickly and reliably. This compound of tin and gold chloride was called "Cassius purple" after one of its inventors and its color. In some circles it was thought that the tin was an essential ingredient, a lost secret that had been rediscovered. The argument was that gold chloride alone could not produce the color, it must be combined with tin in the form of Cassius purple. However, this is not the case. It must not be imagined from this, as some persons have lately stated, that it is necessary to use gold [combined with tin] in the state of Cassius purple. Neri, at the end of the sixteenth and commencement of the seventeenth century, stated, that in order to stain glass a ruby color, it was only necessary to employ calcined chloride of gold. At a later period, Libar wrote to the same effect, and Merret certified that he had proved the efficacy of the process. In 1834 Golfier Besseyre stated, in the Journal of Pharmacy, that Douault Wieland colored his paste with perchloride of gold only. Lastly, in 1836, Fuss writes, that in Bohemia all the ruby-colored glass was prepared with chloride of gold only, and that glass might be stained red as well with metallic gold, as with oxide of gold or Cassius purple. It is therefore a fact known for some time, that glass may be stained red, without either Cassius purple or oxide of tin, with [only] metallic gold or preparations of gold. In the glass-works of Bohemia and Silesia perchloride of gold only is used, without the addition of oxide of tin, in order to produce their fine rose or carmine-colored glass. Of the men cited, Douault-Wieland was a Parisian jeweler who was famous for his artificial gems and crystal glassware. He was praised for his skills by Napoleon. Paul Golfier-Besseyre was a well respected French chemist. Besides many other endeavors, he worked for the glass industry and performed numerous experiments on the formulation of glass. He produced a gold ruby using the same ingredients as Neri. He determined good color could be achieved by letting a new batch of the glass age for a protracted period of time at temperatures below the melting point of gold. Periodically, he removed the glass from the furnace and poured it into water to wash it. The result was a yellowish glass when molten, but when a gaffer finished a piece it was gently reheated and the ruby color developed.